Tuning for E Bikes with the Yamaha PW-SE motor. This is a processor-controlled tuning module for the Yamaha PW-SE drive system, the latest version of the PW engine. 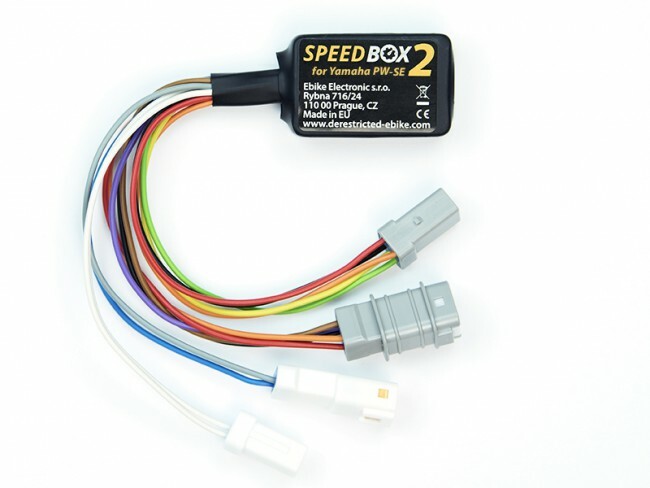 The SpeedBox 2 increases the maximum engine support from 25 km/h to powerful 99 km/h, while the display still shows the correct speed. The module can be simply activated by briefly pressing the WALK button. After pressing the button, the display indicates a speed of 9.9 km/h for a few seconds - this confirms that the SpeedBox 2 has been activated and the engine support has been raised to 50 km/h. A brief press of the lighting button deactivates the module again – then, a speed of 2.5 km/h is briefly displayed for confirmation. Now the engine support ends at 25 km/h as usual. The connection of the SpeedBox 2 to the electric bike is simple and is made via the original connectors. Thanks to the positive-locking plugs, an inadvertent incorrect connection is practically impossible. The connection of the SpeedBox 2 does not cause any damage to the electric bike. According to the manufacturer's specifications, only high-quality electrical components from world-renowned manufacturers are used to produce the SpeedBox 2. The microcomputer that controls the module has even been certified for the automotive industry. - Engine support up to 99 km/h. - Correct display of speed, range, average speed and daily distance travelled. - Activation via the electric bike´s WALK-button. - Compatible with Yamaha displays.